Awin Enterprises is licensed, insured and bonded from the Fire Safety Marshall and C16 fire protection certified. We can install, repair and test any part of of your fire sprinkler system. 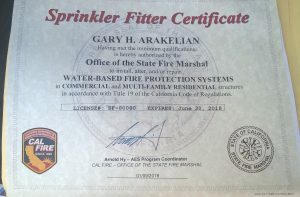 Only Fire Sprinkler contractors with a C-16 License, recognized by the State of California, have the authority to test, certify, inspect, and repair fire sprinklers, sprinkler pipe, and related fire sprinkler equipment. Make sure your property is safe and ready. Contact us to schedule an inspection, repair or installation. Call 818-486-1964 or 424-301-1288 for Providing fire equipment testing to properties in Glendale, Pasadena, Burbank and Los Angeles. AWIN ENTERPRISES is a licensed Engineering Contractor and qualified to install overhead and underground systems. From design to construction for all types of building occupancy projects, we are dedicated to delivering 100% compliance with fire department codes in the jurisdiction. We help reduce property insurance rates that contribute to operating expenses. We can mitigate environmental risk in the community by improving public safety. WE OFFER TITLE 19 TESTING, INSPECTION, INSTALLATION, MAINTENANCE & REPAIR. To find out if your water is safe, or possibly being contaminated by backflow you need backflow test. Without a backflow test and a backflow prevention assembly, your fire sprinkler system could have contaminated your potable water by pushing water back into your kitchen and other facilities in your building or house. If your project was required to have backflow prevention device, then for your safety you are required to have annual backflow testing. Annual backflow testing will guaranty that the device is working properly or discover required repairs. Backflow prevention devices will get certified during backflow testing, repair, or rebuilding. If they were not able to be brought into working order then we can replace backflow assemblies for commercial or residential projects. All commercial and many residential backflow assemblies must be tested annually to comply with regulations and to meet city codes. We send and/or deliver copies of compliance reports to your local water authority. We are a licensed, insured and bonded C16 fire protection contractor and have years of experience. We provide affordable backflow testing to our many satisfied customers. We also offer various inspection schedules to fit your needs from five-year certification, annual, semi-annual, quarterly, monthly and weekly inspections! We can discuss with you about the testing procedure and schedule a time to visit your facility to perform the inspection.